Devotions from My Garden: Guest Post! Today, I have a special treat for you! Bill Jones over at I Was Thinking the Other Day About is guest-posting here and sharing a devotional from his garden! I hope you enjoy and take the time to check out his blog of devotional thoughts and encouragement. I marveled at our backyard’s beauty. 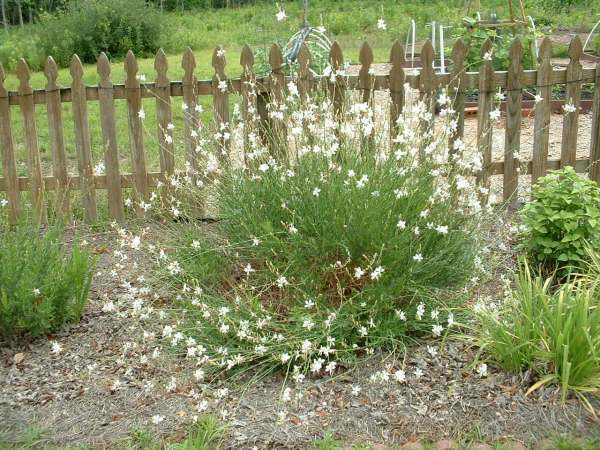 The white phlox beamed beside the weathered picket fence. The hibiscus was nearly eight feet tall and had smothered itself in pink blooms. Long tendrils of the guara held out their flowers and danced as the bumblebees did touch and go landings. Cardinals and bluebirds were bright spots of color at the feeders. Several years earlier the yard was just an expanse of pasture. Over time I built the garden’s structure and established the flower beds. The fence came first and defined the back of the yard. I think I actually applauded in satisfaction when the gate’s latch clicked in place and fit perfectly. A working gate deserved more than a dirt path, so a walkway of red concrete pavers came next. The addition of a pump house with a barn style roof and weathervane on top added a rustic touch to the scene. The bahia grass in the old pasture was so thick that my tiller just dragged me along as it bounced over the top. I’m sure it was comical to watch, but to me it was frustrating. With that obstacle, it became a struggle to transform sections into flower beds. Many exhausting sessions of hand work were required but the transformation did occur. The histories of many of the plants also came to mind. The oak leaf hydrangea was 12 inches tall when planted. Now it covered an area twenty five feet across and has been the mother plant of several more now spaced around the yard. I bought the pagoda plant sight-unseen. 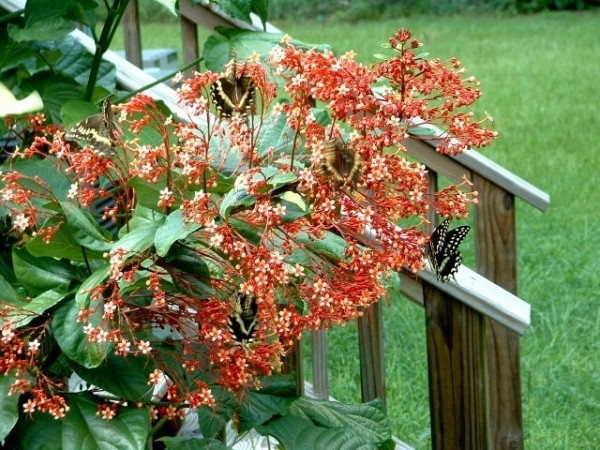 What a surprise we had when it produced spectacular orange blooms over a foot tall that did look like a Chinese pagoda – with multiple stems and flowers in layers that decreased in circumference from the bottom to the top. And they were like butterfly magnets. Standing there, remembering the years of work that had been involved, I could have shouted “Look at this great garden I have built!” Thankfully, I thought better of it and didn’t. I thought of King Nebuchadnezzar who gazed at his city and said: “Is not this great Babylon, that I have built for the house of the kingdom by the might of my power, and for the honour of my majesty? (Daniel 4:30 KJV) At that moment, God showed him who had the power and majesty. The King spent the next seven years eating grass like an ox. I didn’t mimic his words. Not from fear of having to eat grass, but from the realization that without God I could have done nothing. I praised the Lord for the beautiful flowers and birds He created. I thanked Him for the strength to build the fence. I thanked Him for the time, resources and opportunities He had provided. That day I knew what the Apostle Paul meant when he wrote that he had planted and Apollos had watered but God gave the increase (1 Corinthians 3:6). Paul was writing of spiritual growth, but in my physical garden I understood that while I may have built and planted and watered, it was God alone Who, in His power and majesty, had completed it and made it beautiful! Praise God! Lovely garden, Bill. Great Post!